I confess I spent the last week on vacation, away from home and without the time to write about the comics. And it was another of those curiously busy weeks that happens when it’s inconvenient. I’ll try to get caught up ahead of the weekend. No promises. Art and Chip Samson’s The Born Loser for the 10th talks about the statistics of body measurements. Measuring bodies is one of the foundations of modern statistics. Adolphe Quetelet, in the mid-19th century, found a rough relationship between body mass and the square of a person’s height, used today as the base for the body mass index.Francis Galton spent much of the late 19th century developing the tools of statistics and how they might be used to understand human populations with work I will describe as “problematic” because I don’t have the time to get into how much trouble the right mind at the right idea can be. No attempt to measure people’s health with a few simple measurements and derived quantities can be fully successful. Health is too complicated a thing for one or two or even ten quantities to describe. Measures like height-to-waist ratios and body mass indices and the like should be understood as filters, the way temperature and blood pressure are. If one or more of these measurements are in dangerous ranges there’s reason to think there’s a health problem worth investigating here. It doesn’t mean there is; it means there’s reason to think it’s worth spending resources on tests that are more expensive in time and money and energy. And similarly just because all the simple numbers are fine doesn’t mean someone is perfectly healthy. But it suggests that the person is more likely all right than not. They’re guides to setting priorities, easy to understand and requiring no training to use. They’re not a replacement for thought; no guides are. Jeff Harris’s Shortcuts educational panel for the 10th is about zero. It’s got a mix of facts and trivia and puzzles with a few jokes on the side. I don’t have a strong reason to discuss Ashleigh Brilliant’s Pot-Shots rerun for the 11th. It only mentions odds in a way that doesn’t open up to discussing probability. But I do like Brilliant’s “Embrace-the-Doom” tone and I want to share that when I can. John Hambrock’s The Brilliant Mind of Edison Lee for the 13th of July riffs on the world’s leading exporter of statistics, baseball. Organized baseball has always been a statistics-keeping game. The Olympic Ball Club of Philadelphia’s 1837 rules set out what statistics to keep. I’m not sure why the game is so statistics-friendly. It must be in part that the game lends itself to representation as a series of identical events — pitcher throws ball at batter, while runners wait on up to three bases — with so many different outcomes. John Hambrock’s The Brilliant Mind of Edison Lee for the 13th of July, 2016. Properly speaking, the waiting time to buy nachos isn’t a player statistic, but I guess Edison Lee did choose to stop talking to his father for it. Which is strange considering his father’s totally natural and human-like word emission ‘Edison, let’s discuss stats while we wait for the opening pitch’. Alan Schwarz’s book The Numbers Game: Baseball’s Lifelong Fascination With Statistics describes much of the sport’s statistics and record-keeping history. The things recorded have varied over time, with the list of things mostly growing. The number of statistics kept have also tended to grow. Sometimes they get dropped. Runs Batted In were first calculated in 1880, then dropped as an inherently unfair statistic to keep; leadoff hitters were necessarily cheated of chances to get someone else home. How people’s idea of what is worth measuring changes is interesting. It speaks to how we change the ways we look at the same event. Dana Summers’s Bound And Gagged for the 13th uses the old joke about computers being abacuses and the like. I suppose it’s properly true that anything you could do on a real computer could be done on the abacus, just, with a lot ore time and manual labor involved. At some point it’s not worth it, though. Nate Fakes’s Break of Day for the 13th uses the whiteboard full of mathematics to denote intelligence. Cute birds, though. But any animal in eyeglasses looks good. Lab coats are almost as good as eyeglasses. David L Hoyt and Jeff Knurek’s Jumble for the 13th of July, 2016. The link will be gone sometime after mid-August I figure. I hadn’t thought of a student being baffled by using the same formula for an orange and a planet’s circumference because of their enormous difference in size. It feels authentic, though. 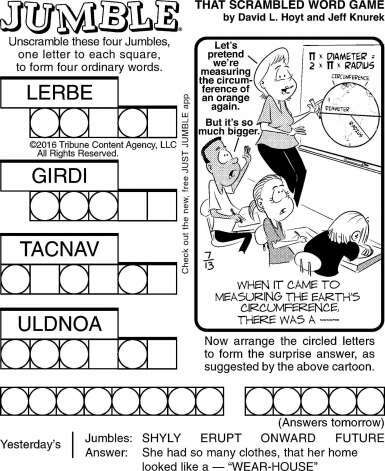 David L Hoyt and Jeff Knurek’s Jumble for the 13th is about one of geometry’s great applications, measuring how large the Earth is. It’s something that can be worked out through ingenuity and a bit of luck. Once you have that, some clever argument lets you work out the distance to the Moon, and its size. And that will let you work out the distance to the Sun, and its size. The Ancient Greeks had worked out all of this reasoning. But they had to make observations with the unaided eye, without good timekeeping — time and position are conjoined ideas — and without photographs or other instantly-made permanent records. So their numbers are, to our eyes, lousy. No matter. The reasoning is brilliant and deserves respect.